Some options in stock. Order in the next 12 hours, 7 minutes and it will go out today! The magician is wearing an all black waistcoat, with or without a jacket. Under minimum cover of a handful of confetti thrown toward the waistcoat (or up in the air), this becomes dotted with white polka dots. Nothing is added or taken away from the waistcoat, which may be worn normally throughout, before and after presentation. For those of you familiar with the original "Colour Change Waistcoat", the "Snow Leopard Vest" incorporates a completely different method. 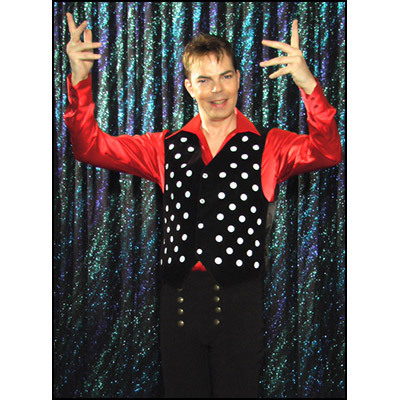 There is an absolute minimum movement made to perform this effect, so minimal that a flash from a small pyrotechnic device or flash pot on the stage will suffice to cover the appearance of the polka dots. I am sure you are all aware of Alberto Sitta's famous "Leopard Silk" - a large plain silk handkerchief is displayed in one hand. The other hand throws a handful of confetti over the silk and it instantly becomes spotted apparently by the confetti. This effect is included in the act of Arturo Brachetti, world famous quick change artist and "transformiste". Arturo has his own colourful version of the "Leopard Silk". There has been an increase in recent years of the performance of the classic "Snow Storm in China". David Copperfield breathed new life into this effect back in 1995, and Kevin James has released the "Snow Animator" in several guises and models, which has become a hit in many a magician's show, often being the final number. The "Snow Leopard Vest" is intended to compliment the performance of either of these effects, or may be used as a number on its own, enhancing any colour change routine. The waistcoat may also accompany any die or domino effect, or indeed as a stand alone effect.